Rutherford Birchard Hayes (October 4, 1822 – January 17, 1893) was an American politician, lawyer, military leader, and the 19th President of the United States (1877 – 1881). He became president following what has long been considered the most disputed election in American history. President Hayes was responsible for the ending of the initially well-intentioned, but highly corrupted, Reconstruction period in the Southern states. He is mainly remembered for the positive reforms he instituted in the civil service. Hayes was born in Delaware, Ohio, on October 4, 1822. His parents were Rutherford Hayes and Sophia Birchard. Hayes was the youngest of five children. Ten weeks before Rutherford was born, his father died. Sardis Birchard, his uncle, played an important role in young Rutherford's life as a father figure and later benefactor for his college education. Rutherford and his sister Fanny were very close. It was his sister who offered Hayes the most encouragement to achieve his dreams. Fanny and Rutherford were the only two children in the family who survived through adulthood. Hayes was home schooled at first, but eventually attended the common schools and later went to the Methodist Academy in Norwalk, Ohio. He graduated from Kenyon College in Gambier, Ohio, in August 1842 and went on to Harvard Law School and graduated in January 1845. He was admitted to the Ohio bar on May 10, 1845, and commenced practice in Lower Sandusky (now Fremont), Ohio. There was very little opportunity in the community for success and subsequently Hayes moved to Cincinnati, Ohio, in 1849 and took up the practice of law. He became the city solicitor in Cincinnati in 1857 and remained in that position until 1859. Several years after moving to Cincinnati, Hayes married his childhood sweetheart, Lucy Ware Webb in 1852. The couple had eight children together. However, three of their sons died before reaching adulthood. Hayes was nearly forty years old, and his wife was expecting their fourth child when the Civil War began. As a firm abolitionist, Hayes laid aside his law practice and volunteered in the Union Army. He was commissioned as a major of the 23rd Ohio Infantry on June 27, 1861. He had no previous military experience. He was wounded in action five times during the war. When offered to be decommissioned due to his wounds, Hayes responded saying that he would rather die in war than do nothing further for the Union. He returned to action and was eventually promoted to the rank of brigadier general as the Civil War was drawing to its end. While still in the military, the Republican Party from Ohio made him their candidate for the United States House of Representatives. He accepted the nomination, although he refused to campaign for the seat, stating, "an officer fit for duty who at this crisis would abandon his post to electioneer…ought to be scalped." He was elected to the House of Representatives in 1864 and served in the 39th United States Congress, but refused to take his seat until the conclusion of the war in April 1865. He won re-election for to the 40th Congress in 1866. He served in Congress from March 4, 1865, to July 20, 1867, when he resigned to accept the Republican nomination to run for governor of Ohio. Hayes was elected and served two terms as governor from 1868 to 1872. During his terms as governor he was known for his thrift and honesty. He appointed state officials on their ability rather than their political party. This was an unusual practice for the time. Under the spoils system, the popular policy throughout the United States at that time, a political leader such as a governor made appointments to public office from within one's own party. Hayes refused to run for a third term as governor. He preferred to return to Washington, D.C. and sought another term in the House of Representatives. However, he was defeated. Hayes retired from public life in 1872 and he happily returned to private life in Spiegel Grove, Ohio. However, his retirement was short lived. The leaders of the Republican Party persuaded him to run for president of the United States in 1876. Based on his previous successes in winning two terms as governor and two terms as representative before that, he was persuaded that the next step was running for election to the White House. Hayes became president following the tumultuous, scandal-ridden years of the Ulysses S. Grant administration. He had a reputation for honesty dating back to his Civil War years. As governor of Ohio, his scrupulous policies sometimes dismayed even his political allies. Hayes was quite famous for his ability to not offend anyone. Henry Adams, a prominent politician at the time, asserted that Hayes was "a third rate nonentity, whose only recommendation is that he is obnoxious to no one." Nevertheless, his opponent in the presidential election, Democrat Samuel J. Tilden, was the favorite to win the presidential election and, in fact, won the popular vote by only 250,000 votes with nearly 8.5 million voters turning out in that election. The Electoral College votes were contested in four states. In order to win, the candidates had to muster 185 votes: Tilden was short by one vote with 184 votes, Hayes had 165. There were 20 votes represented by the four contested states. To make matters worse, three of these states (Florida, Louisiana, and South Carolina) were Southern states, which was still under military occupation. The fourth was Oregon, newly entered into the United States. Additionally, historians note, the election was not fair because of the improper and fraudulent tactics and intimidation perpetrated from both sides. A popular phrase of the day called it an election "without a free ballot and a fair count." In reality, it represented the disenfranchisement of thousands of black voters and threatened to set the cause of equal voting rights back. It was not until four months later that the results of the election were known. To peacefully decide the results of the election, the two houses of Congress set up the Electoral Commission to investigate and decide the rightful and actual winner. The commission was constituted with 15 members: five from the House, five from the Senate, and five from the Supreme Court. Additionally, the commission was bi-partisan consisting of 7 Democrats, 7 Republicans, and a "swing" vote in Joseph P. Bradley, a Supreme Court Justice. Bradley, however, was a Republican at heart and thus the ruling followed party lines: 8 to 7 voted for Hayes winning in all of the contested 20 electoral votes. An agreement was made between Democrats and the Republicans. Key Ohio Republicans like James A. Garfield and the Democrats agreed at a Washington hotel on the Wormley House Agreement. Southern Democrats were given assurances that if Hayes became president, at least one Southerner would be in his cabinet, federal troops would be pulled out of the South, and Reconstruction would come to an end. 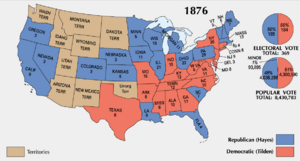 This compromise of 1877 is sometimes considered to be the second "Corrupt Bargain" (the first being charges that John Quincy Adams and Henry Clay conspired to deny Andrew Jackson the presidency when the 1824 election was thrown into the House of Representatives). President Hayes was a devoutly religious man. He refused to take the oath of office for the presidency on March 3, 1877, which was a Sunday. Partly out of the controversy that had swirled around the election, Hayes was sworn in on March 3 in a private ceremony in the Red Room of the White House. He agreed to be sworn into office publicly at the traditional site, The United States Capitol Building steps, the following Monday, March 4. He served until March 3, 1881. In domestic affairs, aside from reconciliation with the South, his administration was noteworthy for two achievements, both giving evidence of a strong president, resolute in his relations with Congress. The first was the resumption of gold as the backing of the paper currency and bonds that had financed the war. The second was the beginning of civil service reform. Hayes' first step in civil service reform, in June 1877, was to issue an executive order forbidding federal civil servants to take an active part in politics. His goal was to establish a merit system of advancement, but this order brought him into fateful collision with congressional spoilsmen. Although political opposition prevented most of the reforms he sought, Hayes was able to keep the issue before the people and helped pave the way for future legislation. In this mainly victorious test, Hayes removed not only a subordinate, Alonzo B. Cornell, from the New York custom house but also the port collector, Chester A. Arthur, who would later serve two separate terms as United States president. Both men were Republicans. 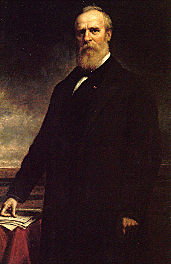 In 1878, Hayes was formally asked by Argentina to act as arbitrator following the War of the Triple Alliance. The war pitted Argentina, Brazil, and Uruguay against Paraguay. The Argentines hoped that Hayes would give the Chaco region to them; however, he decided in favor of Paraguay. His decision made him a hero in Paraguay, which renamed a city, Villa Hayes, and a government department in his honor. For the most part, Hayes' administration was not involved deeply in foreign policy. Most of the foreign problems during his time in office were small and insignificant. During his presidency, Hayes signed a number of bills, including one signed on February 15, 1879, which for the first time, allowed female attorneys to argue cases before the Supreme Court of the United States. A one-term president, Hayes did not seek re-election in United States presidential election in 1880, keeping the pledge he made as part of the compromise resulting in his winning the 1876 election, that he would not run for a second term. He had, in his inaugural address, proposed a one-term limit for the presidency combined with an increase in the term length to six years. Rutherford Birchard Hayes died of complications of a heart attack in Fremont, Ohio, Sandusky County, Ohio, at 11:00 p.m. on Tuesday, January 17, 1893. Interment was in Oakwood Cemetery. Following the gift of his home to the state of Ohio for the Spiegel Grove State Park, he was re-interred there in 1915. Hayes was the first U.S. President to visit the West Coast of the United States while in office. Hayes has both a city (Villa Hayes) and a department (Presidente Hayes) named after him in Paraguay. Hayes arbitrated a dispute between Argentina and Paraguay in Paraguay's favor and was honored in gratitude. All links retrieved February 11, 2014. 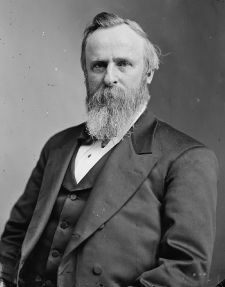 History of "Rutherford B. Hayes"
This page was last modified on 11 February 2014, at 15:10.